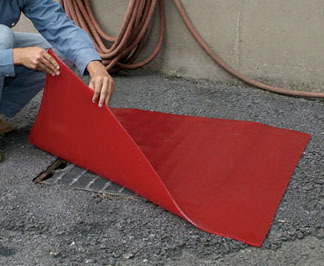 Block a drain immediately in the event of a spill to reduce the cost of clea-up and contamination. Choose Drain Cover: Polyurethane DrainCover 36"x36" Polyurethane DrainCover 42"x42"
100% Chemically Resistant Polyurethane - these tough but easy to handle Drain Covers are made of solid polyurethane. Reversible - they are tacky on both sides, so either side can be used to form a tight seal blocking contaminants. Reusable - wash after use with mild soap and water. More chemical resistant than plastics or rubbers, these DrainCovers stand up to a wide range of chemicals, solvents, and oils.